I can't believe we are in October already and it's whizzing by so quickly too. Quite scary. This really is my favorite time of year and on a long drive out yesterday as passenger instead of driver, I was able to take in the beauty of all the amazing colours as the leaves on the trees are turning. Stunning. I really to need to make something with those colours. For now though it's all about the cracked ice technique. I managed to grab a little time earlier in the week and have been wanting to re visit this technique. I managed to find one piece of silver foil and made these two cards along side each other. So quick and easy but I must admit I'm not as in love with the look as I was when I first stumbled on the technique. All that's needed are stamps of your choice, black archival ink, versamark and embossing powder. Stamp Set... Leaves. Both sets are very old and I believe they are by Creative Expressions but any you have will do. Stamp set... Bloom and Grow by Visible Image. Cut the silver foil to the size you would like. Take the black ink pad and holding it lightly, drag it down the silver foil. repeat all the way across the card. Turn the card top to bottom and repeat. To darken the edge just gently drag the ink pad down a few times and do the same at the bottom. 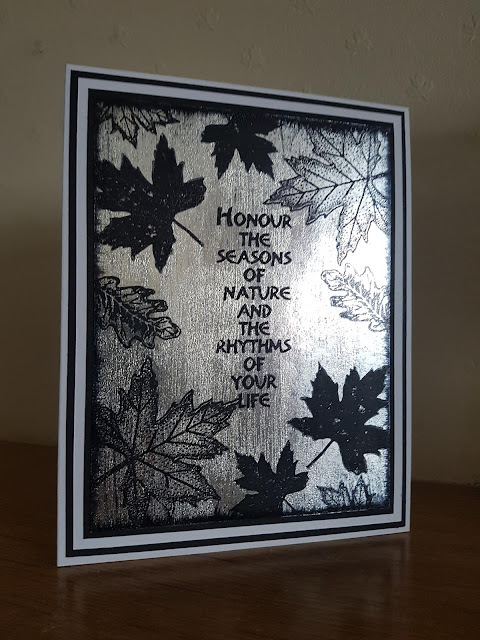 Take the verse from the leaves set and stamp it into the middle of the foil. Take two or three of the leaves and using the same ink, stamp randomly over the foil. My ink pad is drying out so the solid images were not easy to do. 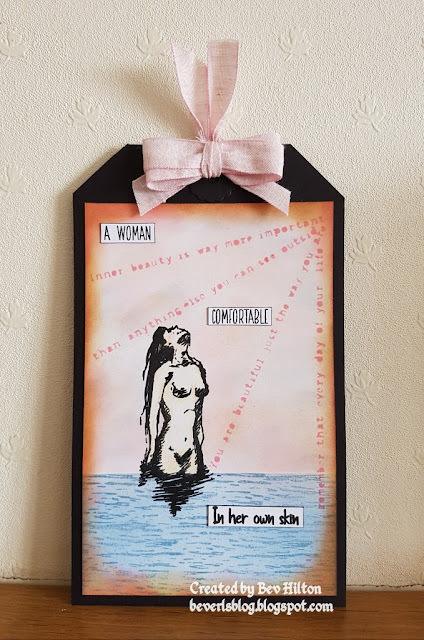 I did use my stamp press which helped as I was able to repeat stamp. Set aside to dry. 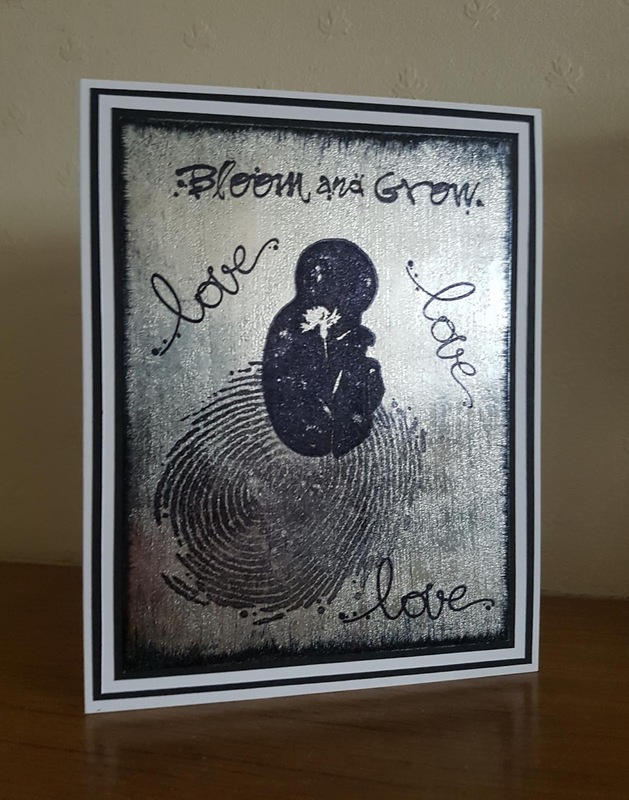 I did the second card exactly the same but using the Bloom and Grow set. Once the ink is thoroughly dry, take the versamark pad and very gently and without pressure, drag in down the card in the same way as the black ink, making sure you try and keep it even across the foil. Apply the embossing powder and heat set. This gives the look of ice. Quite effective and the photos really don't do it justice. I mounted onto black card and then onto white. I then mounted once again onto black before mounting onto the card base.